Wine preferences are very personal and subjective. At Grapes N’ Barrels we respect individual tastes and offer varietals that will yield the desired attributes of the wine you choose. In addition, we embrace the interest and creative blending of varietal wines to arrive at new and unique mixes that offer interesting, complex, excellent tasting wine blends. Whatever your preference, to follow the path of a singular wine variety such as Cabernet Sauvignon, or Merlot, or Chardonnay… or, to blend such as a Cabernet-Merlot or Chardonnay-Viognier, let us guide you to the wine choice that you will be thrilled with. Grapes N’ Barrels offers a broad range of wines to select from. Our aim is to present wine selections that appeal to the winemaker’s tastes and desired level of involvement in the winemaking process. Our wines can be made with ‘fresh’ grapes in spring and fall: Chilean Wines- late May through June; Californian Wines and Italian Wines – late September through November. 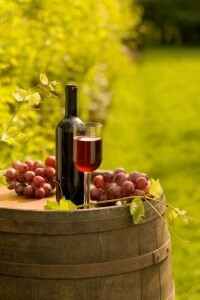 And if you choose to use ‘frozen’ grape must or wine ‘juices’, you can make your wine at any time, all year long! A Deeper Dive into Wine Selection: Knowing ‘American Viticultural Area’, ‘Appellation’ and Vineyard. At Grapes N’ Barrels our wines are categorized by geographic region where Fresh Grapes, Frozen Must or Wine Juices are sourced. So you will find our grape sources from California, Italy and Chile. Each wine-producing country follows guidelines that define a specific wine-growing region commonly referred to as the “appellation”. In short, Grapes N’ Barrels selects grapes based on the appellation, or legally defined area where our wine grapes are grown. The reason: Appellations are generally categorized by similar climate, soil, elevation and properties that give the wine a certain characteristic. Knowing a wines appellation is an important consideration in winemaking since we want to assure that our source is reliable and will yield the wine attributes we seek. In the United States we do not use the word ‘appellation’; instead we use a system called ‘AVA’, or American Viticultral Area. To claim an AVA name on a wine, 85% of the wine must have been made with grapes grown in the geographical AVA region. In Italy, the definition of a specific appellation falls under the jurisdiction of the Denominazione di Origine Controllata(DOC). Chile has a designation for viticultural regions as well. Knowing the appellation does not guarantee the quality of the wine. What is most important to the winemaker is that our sources are named and grape qualities are known and can be relied on. In addition to knowing the wine appellation, there is an important benefit to selecting wines made from Frozen Must: We know the ‘Vineyard’ and where our wine grapes are grown. Grapes N’ Barrels has the unique ability to source frozen must from cited U.S. AVA/and Italian and Chilean Appellations. But, one differentiating fact is that Grapes N’ Barrels can identify and name the vineyard and grape grower for the wines produced. So, our winemakers know exactly where their wine emanated from. In addition, if you are planning a trip to California, Chile, or Italy let us know. Many times the vineyard owner welcomes our winemakers for tours and a bit of wine-tasting when available. Please review the Grapes N’ Barrels wines offered. Also note that if there is a wine you would like to make that is not listed, please let us know and we will do our best to investigate and accommodate your wine making interest. Availability is subject to change without notice. Some varieties may unexpectedly become unavailable due to circumstances beyond our control.